Portuguese explorer Vasco da Gama discovered a sea route that facilitated the spice trade between India and Portugal. 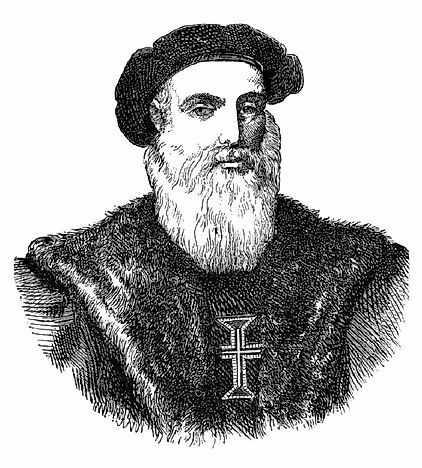 Vasco da Gama was honored as a Viceroy, Count, and Admiral. Vasco da Gama was a Portuguese explorer, soldier, ambassador and count. Vasco was born around 1460 in Sines, Portugal. His father, Estevao, was the Civil Governor of the port city of Sines, and had close ties to King John II. Vasco's early education was spent in Evora, where he studied navigation and mathematics. One legend says that he was once under the tutelage of the famous astrologer, Abraham Zacuto. Vasco, like his father, was a member of the Order of Santiago, whose titular head was King John II of Portugal. Vasco's later accomplishments were seen by many to be comparable to the great discoveries of Christopher Columbus. As the son of the governor of Sines, Vasco was given more chances of fulfilling his ambitions to become an explorer there were many other young men of his era. He grew up versed in the subject, and soon became a considerably proficient navigator. At that time, King Manuel of Portugal was intent on finding a sea route to India, and Vasco was a natural choice for the task because of his education and his father's close ties to the court. In 1497, the king gave Vasco four ships for the expedition. It proved to be a good decision for the king when Vasco successfully traded in India and brought back spices to Portugal. Later expeditions proved as successful, and were met with little resistance from the natives. The expeditions that Vasco commanded enabled Portugal to trade directly with India, and also with the Atlantic and Indian Ocean coasts of Africa. The expeditions and explorations Vasco mounted were funded by the king of Portugal, and reached such exotic places in India as Calicut. Vasco also made a port call at the Cape Verde Islands. He soon landed at several other exotic coastal areas as well, including Kilimane, Mozambique, Mombasa, and Malindi. Vasco also made a stop in the Azores before voyaging back home to Portugal. In 1502 and 1524, Vasco returned to India. The first trip was to exact revenge on the city of Calicut for attacking Portuguese ships, and on the second he came as the Indian Viceroy from Portugal. There were many challenges that Vasco had to weather throughout his career. One was the spice trade's control under the thumb of competing Muslim traders. The King of Portugal wanted Vasco to deal directly with the Indian traders, and remove the middlemen in the lucrative spice trade. Another problem was that the Muslim traders controlled many African towns in the African coast that were the source of gold and ivory. Then there were problems of mistaken identities, as Vasco and his men were mistaken as their aforementioned rivals, the Islamic merchants. As such they were initially welcomed into Mombasa, only to later narrowly escape having their entire fleet destroyed when the truth was discovered. In India, he mistook the people of Calicut as Christians, and was disappointed when he learned they were not. Vasco was fortunate to have the patronage of King Manuel and King John II. His expeditions were mostly profitable, and he was rewarded the title of Admiral of the Indian Seas, as well as being proclaimed First Count of Vidiguerira. However, he was not to live long after settling in India as Portugal's Viceroy there. On the 24th of December, 1524, he passed away in Cochin after a bout with Malaria. Despite his early death, Vasco was recognized for his contributions in finding the sea route that he opened up for the Portuguese-Indian spice trade. Historians remember Vasco as an explorer, and many Portuguese continue to honor him by writing about his epic voyages.